In 2011, Beijing Association of Dongba Culture and Arts (ADCA) has achieved some progress with the deciphering and translation of Dongba manuscripts possessed by France. 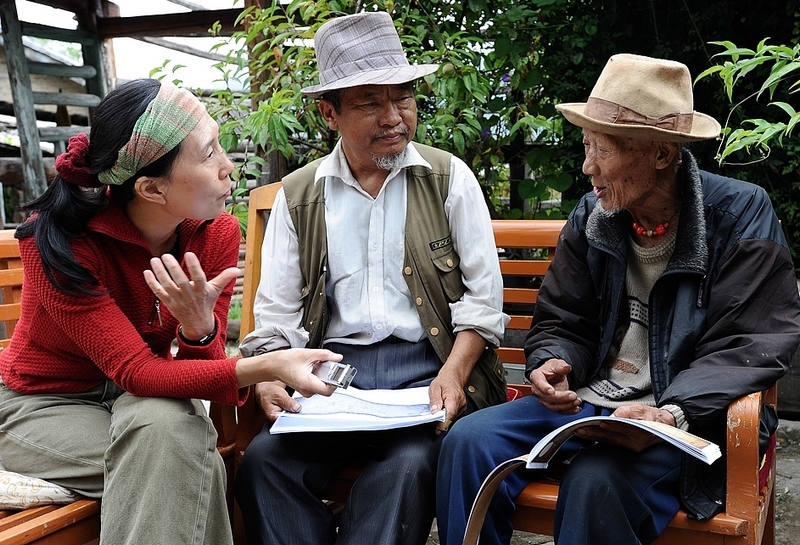 In summer, the ADCA president Zhang Xu, in charge of ADCA major project Bai Feng (Ancient Dongba Manuscripts International Studies), and ADCA member Zhao Xueyi went to visit 84 years old Dongba Shaman, who is living in Tibetan areas of Yunnan Shangri-La Baidi，Sanba village, and the team members convinced him to do the text explanation for one set of Dongba manuscripts titled "Inviting house God with Thirteen Divine Arrows on the Spirit Road", that is collected by French School of Asia Studies (EFEO). 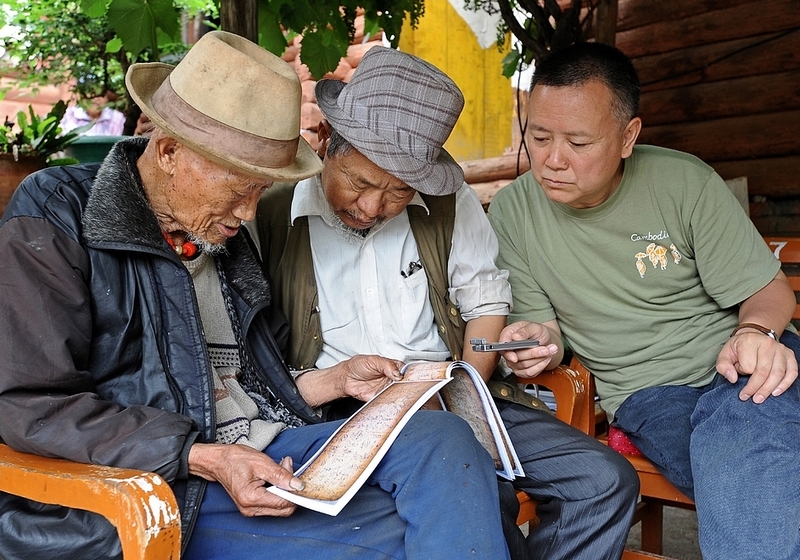 The deciphering and translation work was helped by Naxi researcher Mr. Yang Zhengwen and 70 years old Dongba Shaman, Xi Shanghong, who was a disciple of "Dongba King" in Dongba village. This set of Dongba manuscript is a very important manuscript of three volumes brought by Joseph Rock to EFEO in 1937, originating from Shangri-La Naxi village in Yunnan Tibetan area. ADCA chose this manuscript for translation because it plays an important role in the Naxi funeral ritual. In this ritual, the Dongba Shaman will spread "The Spirit Road", a fifteen meters long painting scroll on the ground, and then he will recite this manuscripts for sending the souls pass from the Hell, through the Human Time and finally to the Heaven along the Spirit Road. "The Spirit Road" is described as "the world's longest vertical scroll painting". 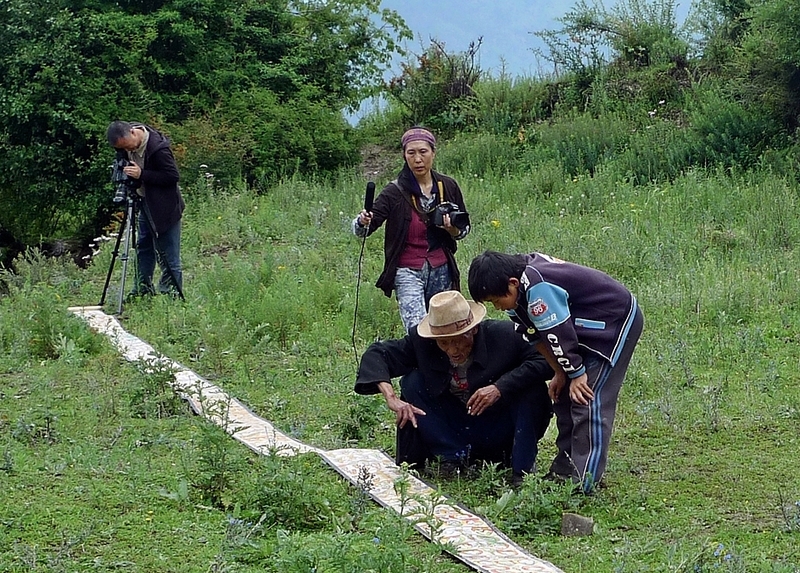 In the villages, ADCA work with Dongba shamans, and at the same time, shoot the whole process of deciphering work by HD camera for saving this endangered culture according to the international practice. The Dongba shamans were old and sick, so the ADCA members cured them by medicine and some treatments during the work. Although the task was very hard and also Lack of funds, the whole team feel really happy to saving this cultural heritage "Memory of the World" in their effort. Bai Feng shooting a record while Dongba shaman He Zhiben deciphered ancient Naxi manuscripts in possession of EFEO to rescue the endangered culture of Dongba religion. 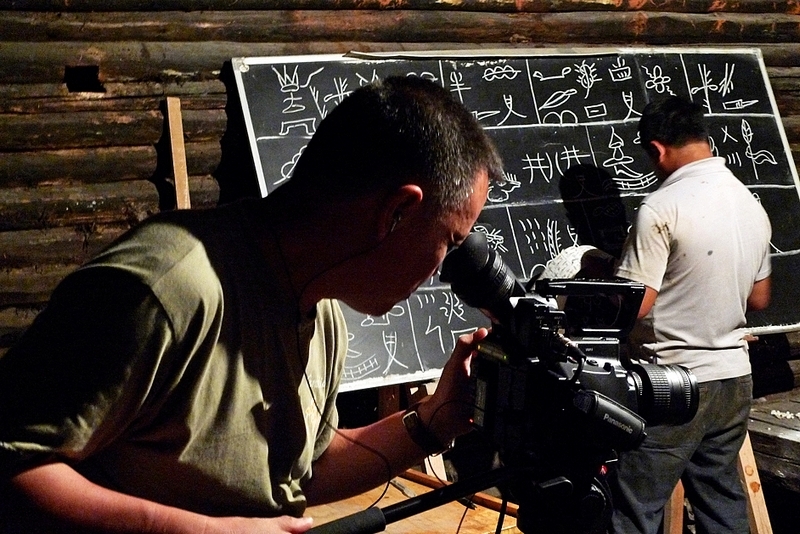 Zhang Xu and He Zhiben, Dongba shaman deciphered the ancient Dongba manuscripts while Bai Feng is shooting record to rescue endangered living Dongba pictograph. 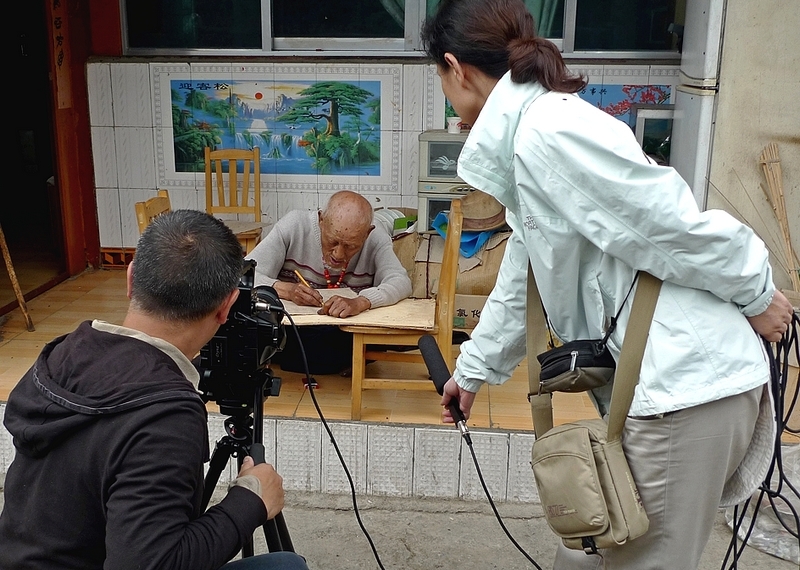 In Shangri-La Baishuitai village, Bai Feng and Zhang Xu shooting records in the class of Dongba Culture School. Pictured villagers are copying Dongba hieroglyphs on the blackboard. 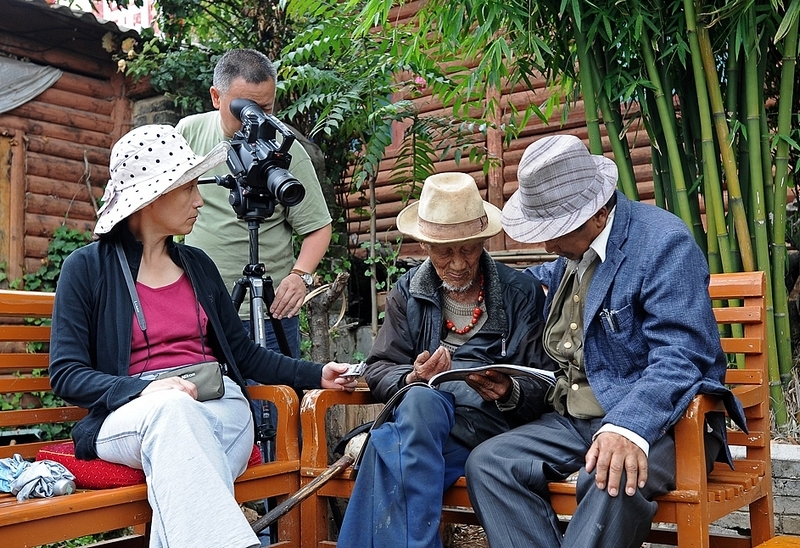 Bai Feng shooting and recording Dongba shaman He Zhiben with Yang Zhengwen in deciphering process of Dongba manuscripts which are in possession of the EFEO. 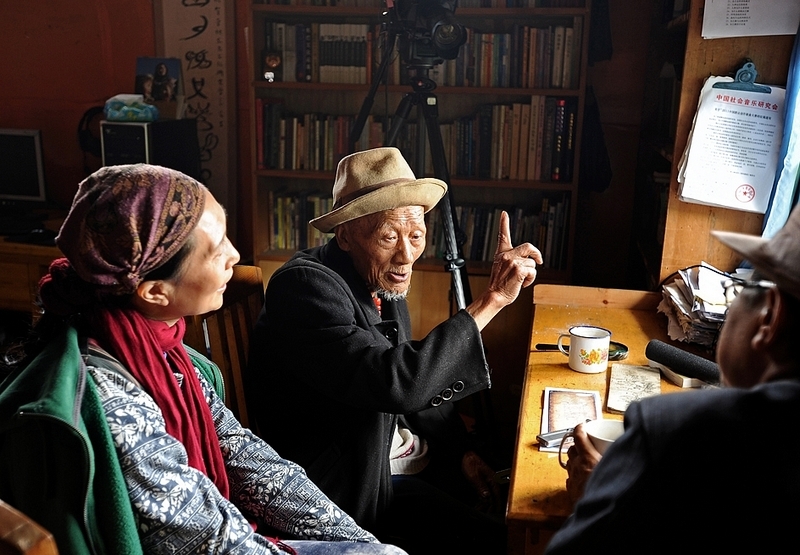 In Tibetan mountain areas Shangri-La, Bai Feng and Zhang Xu shooting records of Dongba scroll painting "The Spirit Road" (15m), drawn by Dongba shaman. Dongba shaman He Zhiben explaining "The Spirit Road" to his grandson. 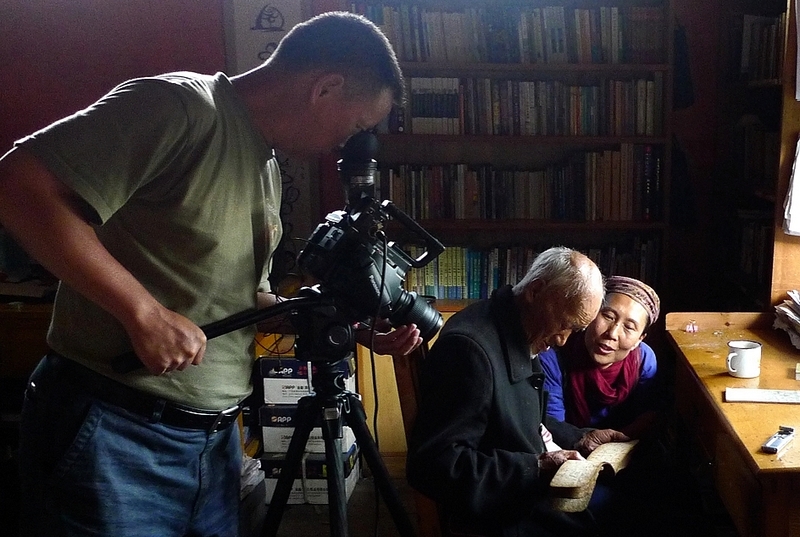 Bai Feng and Zhang Xu recording audio and video of translation Dongba manuscript of EFEO by Dongba Shaman Xi Shanghong. 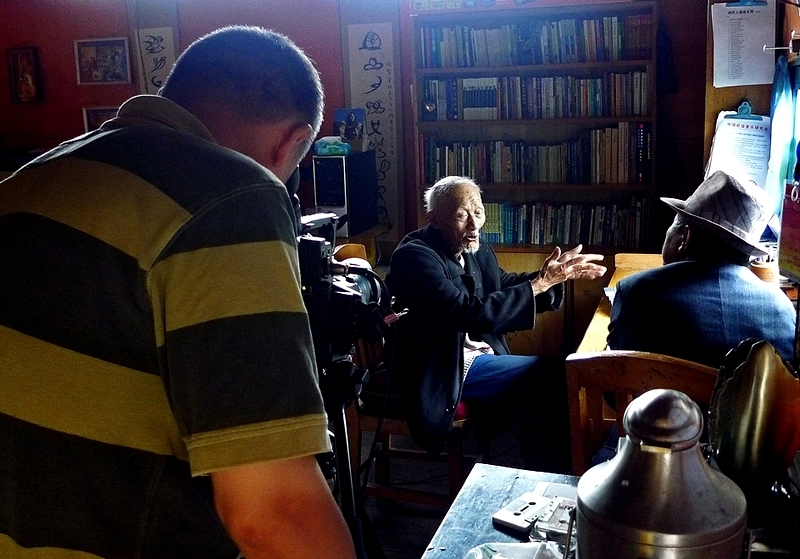 Bai Feng shooting record in Dongba Culture School classroom in village of Shangri-La. Zhang Xu and Dongba shaman Xi Shanghong during exploration of The National Library of France's Dongba manuscripts. 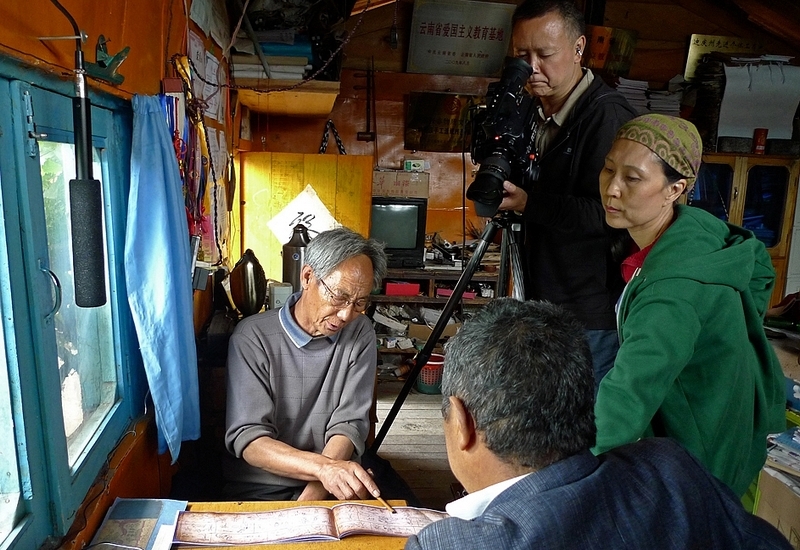 ADCA members work with Dongba shamans from Dongba village exploring EFEO's Dongba manuscripts on the project of Ancient Dongba Manuscripts International Studies. Bai Feng taking sound recordings of Dongba shaman He Zhiben and Yang Zhengwen deciphering and translating Dongba manuscripts of EFEO. The Dongba shaman He Zhiben explaining to Zhang Xu and Yang Zhengwen how he deciphered EFEO's Dongba manuscripts. 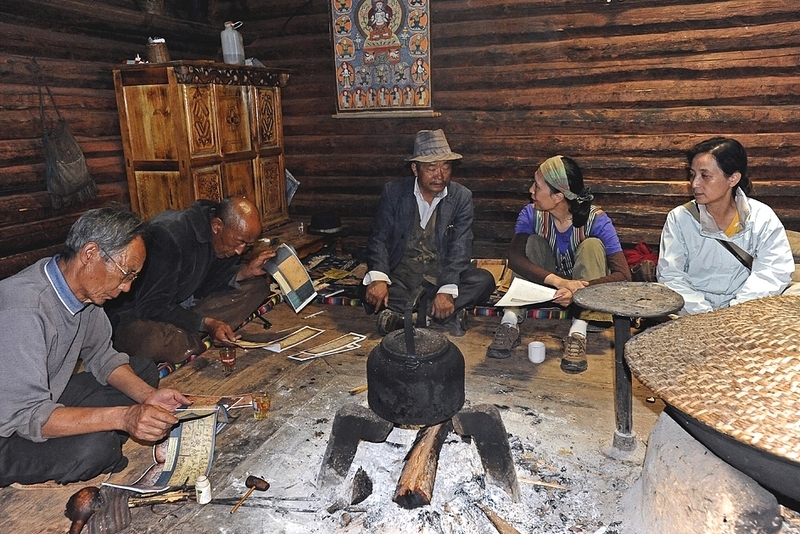 Zhang Xu and Yang Zhengwen work with Dongba shaman He Zhiben during researching of EFEO's Dongba manuscripts. 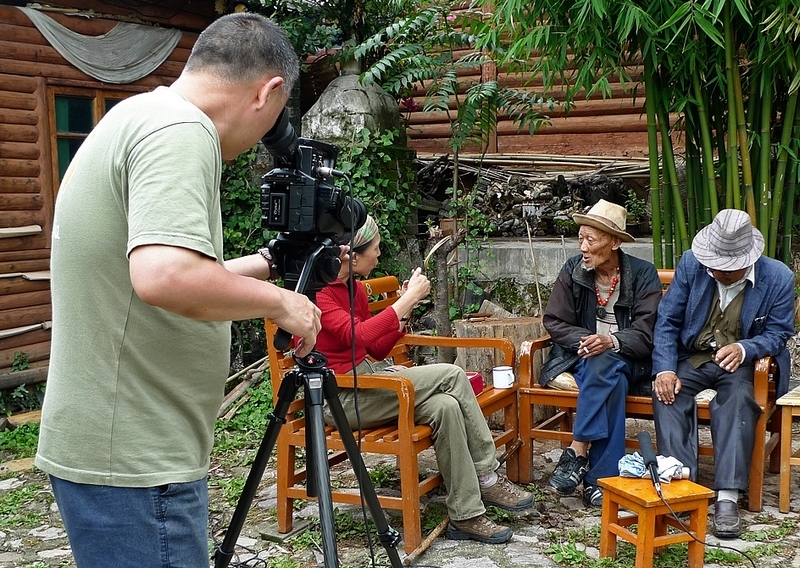 Zhao Xueyi and Bai Feng recording sound and video of Dongba shaman He Zhiben and Yang Zhengwen during deciphering of EFEO's Dongba manuscripts. Bai Feng shooting audio and video record of Dongba shaman He Zhiben and Yang Zhengwen during translation of EFEO's Dongba manuscripts. Bai Feng shooting audio and video record of Dongba shaman He Zhiben and Yang Zhengwen discussing EFEO's Dongba manuscripts. Dongba shaman He Zhiben answers questions on French collection of Dongba manuscripts to Zhang Xu and Yang Zhengwen. 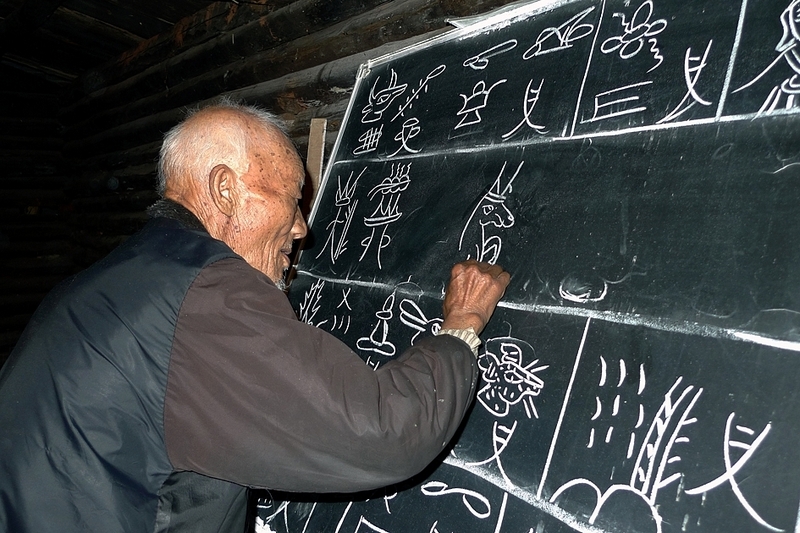 The 84-year-old Dongba shaman He Zhiben teaching in Sanba village and writing Dongba hieroglyphs. 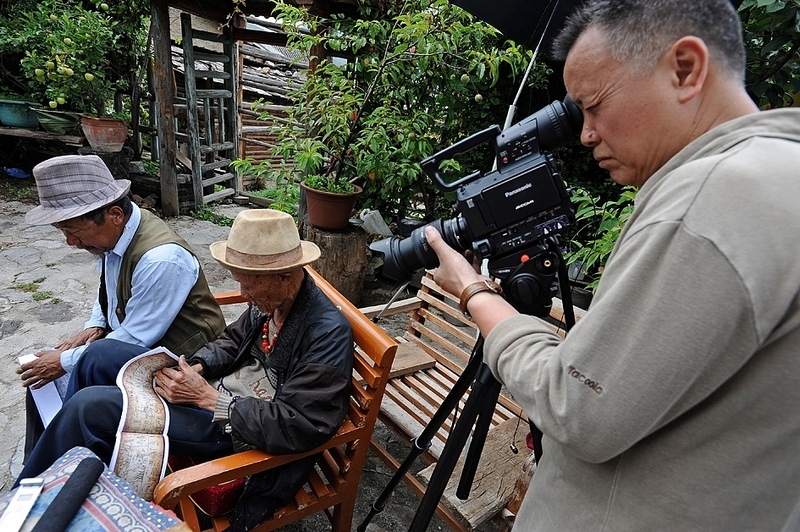 Bai Feng and Zhao Xueyi shooting record of Dongba shaman He Zhiben enrolling drawn Dongba scroll painting"The Spirit Road" (15m). 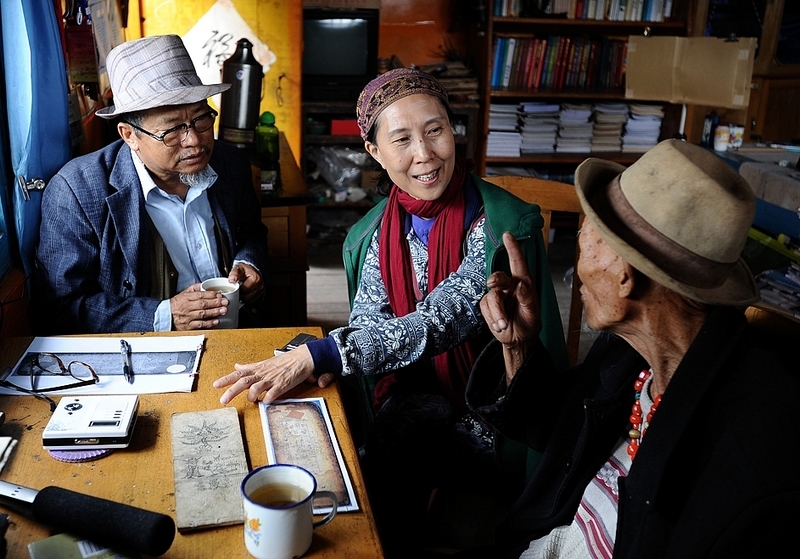 Bai Feng shooting record of a discussion between ADCA president Zhang Xu, Dongba shaman He Zhiben and scholar Yang Zhengwen about EFEO's Dongba manuscripts. 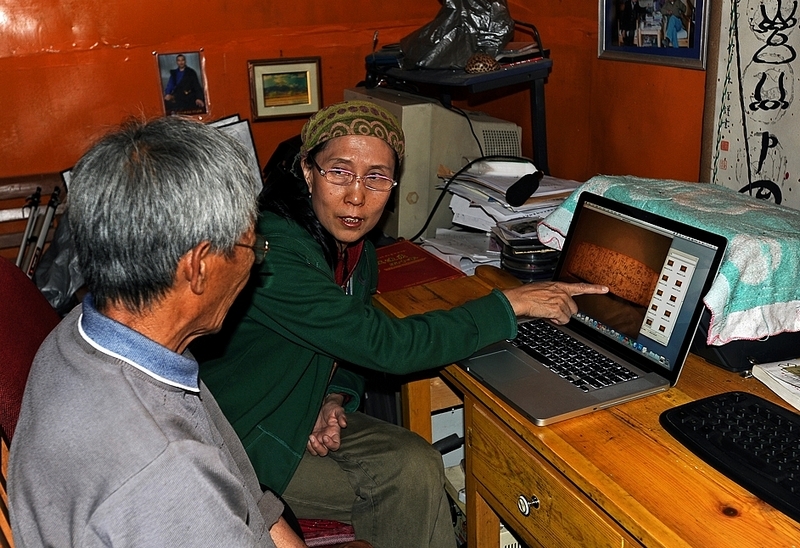 Bai Feng recording Dongba shaman He Zhiben by voice recorder during the rescue process of EFEO's Dongba manuscripts. 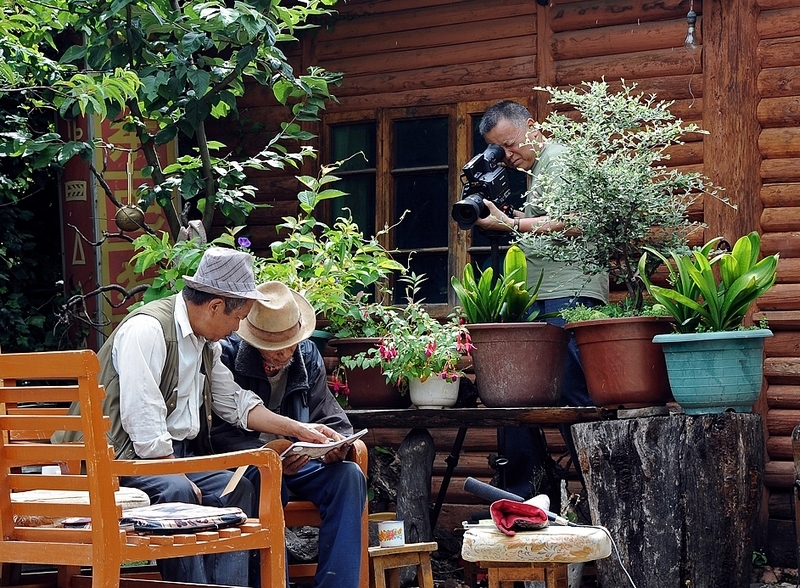 Bai Feng and Zhao Xueyi shooting record of Dongba shaman He Zhiben drawing Dongba divination painting "Bage" in his home. Dongba shaman Xi Shanghong during research for translating EFEO's Dongba manuscripts with Zhang Xu.